Over 1% of ballot papers has been invalidated. 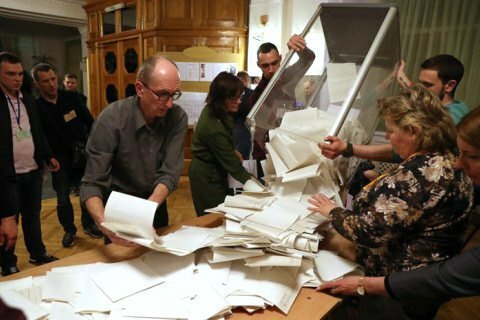 With 90.08% of vote count reports processed, comedian Volodymyr Zelenskyy and incumbent President Petro Poroshenko have received 30.26% and 15.99% of votes in the presidential election respectively, according to the website of the Central Electoral Commission. Fatherland party leader Yuliya Tymoshenko has 13.35% and Opposition Platform-For Life leader Yuriy Boyko has 11.53%. Civic Position leader Anatoliy Hrytsenko received 7%, former Security Service of Ukraine (SBU) chief Ihor Smeshko 5.97%, Radical Party leader Oleh Lyashko 5.43%, Opposition Bloc candidate Oleksandr Vilkul 4.24%, and Freedom representative 1.65%. Some 1.18% of ballot papers have been invalidated.